Beyond Bedding's Cowboy Crib Bedding can bring back happy memories for parents and make new memories for future cowboys and cowgirls. Both patriotic and stylish like our camo crib bedding sets, all our Cowboy baby bedding sets are designed to turn any room in your home into a magical wild western playroom. 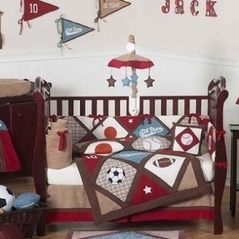 The retro Western crib bedding sets consist of favorites that will make your boy or girl's nursery feel similar to the one you had as a child. 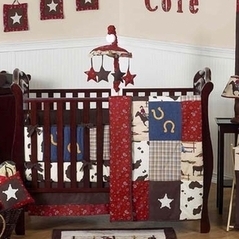 Cowboy baby crib bedding is perfect for your future cowboy or girl and check out our Ride 'em Western Western crib bedding in blue and red, and also Casey's Cabin. 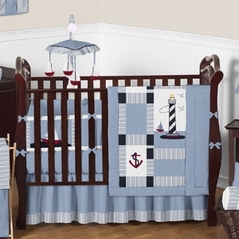 You'll have great fun creating a home on the range with our Western baby crib Bedding. Don't pay a fortune - our discount kids western baby bedding is affordable and adorable! Our vintage cowboy baby bedding and vintage cowboy crib bedding is also available with matching accessories. Be sure to check out our other great baby bedding ideas from categories like our plaid baby bedding section which includes the Trend Lab Caterpillar Bedding set and the popular fire truck crib bedding set or a Planes, Trains, and Automobiles theme!